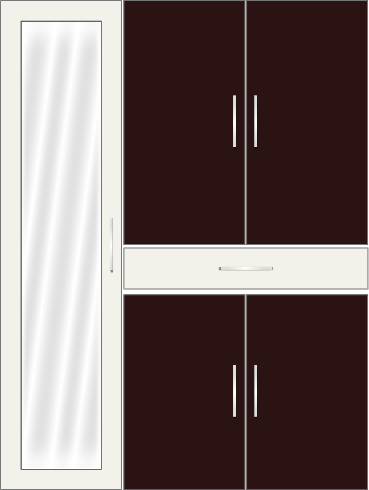 A basic three-door wardrobe with an elegant brown and plain white. 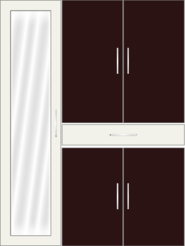 The left single door wardrobe has a mirror and a number of internal removable partitions. This can be used as a dresser along with some other storage. Ideal for a small bedroom or for a secondary storage in a bigger room. The right side two-door wardrobe has provisions for cloth hanger and a couple of internal pull outs and note that, the cloth hanger is not given by default but can be added at a very cheaper price. Along with this, there are a lot of small and big removable partitions that can be used to store small to medium items. 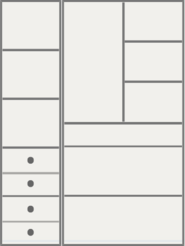 If need be, the partitions can be shuffled to store tall or huge items. This wardrobe can be set against any neutral color wall or against dark wall in a lowly lit room for a rich finish.